Total Cell Phone Ban in Cars? This should be a “no-brainer.” Experts day driving while using a cell phone is about the same as driving drunk. But no-brainers of the world still insist upon doing both…and fight for their right to do so…. Eveybody knows drinking and driving is a no-no. Now, a national safety group wants to get us to look at using cell phones while driving in the same way. The National Safety Council is calling for a total ban on cell phone use while driving. And the council wants the ban to include the use of hands-free attachments. Ninety percent of the nation’s 300 million residents have cell phone accounts, CTIA says. It’s the first time the group has taken such a position. The council’s head, Janet Froetscher, says using a cell phone behind the wheel makes the risk of having a crash four times greater than for those who don’t call and drive. No state currently bans all cell phone use while driving. 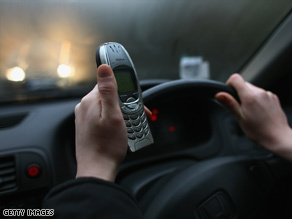 However, six states and the District of Columbia forbid the use of hand-held cell phones behind the wheel. You are currently browsing the archives for the driving category.